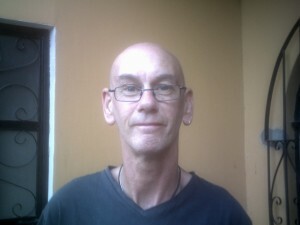 I.m a British ex-pat that lives in Guatemala, Central America. I’ve been here on and off for about eighteen years. Many years ago I stumbled across it on one of my trips and fell in love with the place. When I returned a second time I fell in love with a latina. As she already had kids I became a step-dad to three, who have grown up and started their own families. Now I am a grandad to eight. My passion for reading started when i was around fourteen and hasn’t stopped yet. At first i would devour anything, mostly thrillers and detective stories. I had to borrow, as I never had money to buy books. This continued until one day on an Indian beach i swapped a book with another traveller. The book was The Lord of the Rings and it changed my reading habits. Since then I’ve been an avid fantasy fan. It wasn’t until I was in my late 30s that i actually tried to write. I enjoyed the process and so continued. I think the urge to do something creative spurred me on. It wasn’t a burning passion to write, more like a smouldering ember. I started out in life wanting to be an artist, but that idea evapourated over time. My second passion ,travelling, consumed me for many years and it wasn’t until I belatedly entered Higher Education that I entertained the idea. At the back of my mind there was always the idea to do something creative, but i didn’t know what. I was encouraged to try my hand at it by several tutors. When I graduated i sat down to write and didn’t get very far, but i took those few pages with me when i returned to Guatemala once again. For some reason in Guatemala i was able to sit down and finish the novel. As I was happy with the result i decided to write more. I am a seat of the pants writer. Probably not the best way to approach it, but i’m too impatient to plan or research. I also think another reason I write fantasy is because things don’t have to be a 100% accurate. Readers suspend belief when they pick up a fiction book, but fantasy readers are even more forgiving. In other words, I’m pretty lazy. i prefer to get stuck into the writing than mess around with the details. I always start out with well defined character and then look for situation to put him in. I already know that there’s going to be a happy ending, but once i’ve laid out the situation in the first few chapters I haven’t a clue how to get there. Developing the situation is usually a slow and painful process in which i probably add far too much detail, but it aids the thinking process. The plot of my first novel isn’t original, but it is one that i could fit my own character within and play with. It’s all pretty much up in the air and characters are developed as they are added. My characters are built around what i think would be my reactions in particular situations. The main characters are mostly constructed as a mixture of people from my own environment and of course, their behaviour. This is who and what i know best. I can understand their thoughts and feelings. They are carried around in my head until i finish the novel. I don’t hold conversations with them, but do try to see different situations through their eyes. In my second novel I did depart from this and all the characters are totally fictions of my imagination. If you have more interest than just trying to make money, then write what pleases you, the way you want to write it. Like most first time authors who know nothing about the publishing world I tried traditional publishing, but finally gave up after many years and constant rejection. I decided not to bother anymore and then some time after a friend told me about Amazon. My advise would be to self publish first and then look for a traditional publisher at your leisure. If nothing else, the ego boost that you get from seeing your work published is well worth it. Electronic publishing will eventually take over, but not for many years. most of us still like the feel of a real book in our hands.